Located in the mountain region of western North Carolina, Cold Mountain is the forth highest mountain in the eastern USA. Cold Mountain is one of the Great Balsam Mountains, a subrange of the Blue Ridge Mountains that form part of the Appalachian Mountain Chain. Originally owned by George Washington Vanderbilt II, the land and mountain were sold after his death to the United States Forest Service, forming the first national forest in the eastern United States. 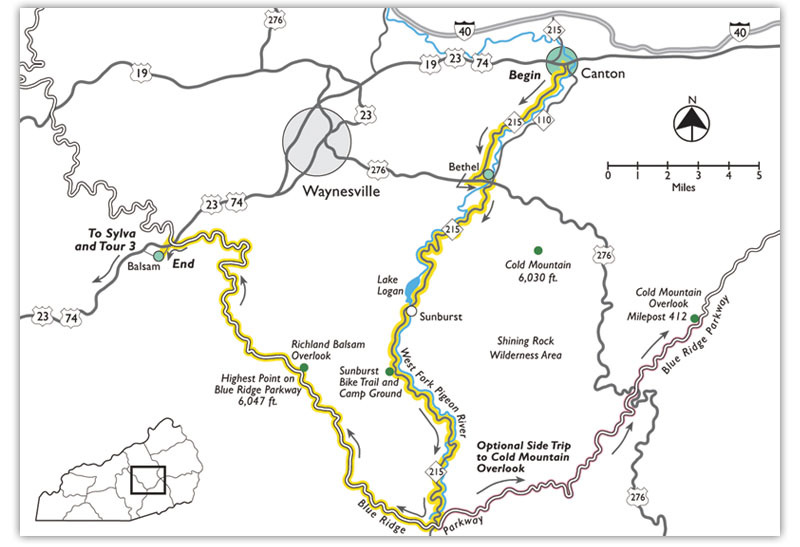 Cold Mountain is situated in the Pisgah National Forest, within the Shining Rock Wilderness. Lying entirely within federal lands, the mountain is uninhabited and is a popular area for visitors. Although it rises to over 6,000 feet, Cold Mountain provides an easy hiking route to the summit and offers spectacular views of the national forest and the Blue Ridge Mountains and Parkway. The Shining Rock Wilderness covers over 18,000 acres of land and forestry and is a protected wilderness area within the Pisgah National Forest. Shining Wilderness is protected by the United States Forest Service as part of the National Wilderness Preservation System, set up to ensure that man does not damage wilderness areas through motorized leisure activities and unauthorized development. Camping, horse riding, and hiking are permitted in the area, but visitors are encouraged to remove all litter and evidence of their activities. Shining Rock is home to a variety of mammals, birds and reptiles, including black bears, deer and bobcats; it is famed for the cluster of quartz boulders that give the area its name. The Art Loeb Rock Trail, one of North America’s greatest hikes, passes through Shining Rock and the base of Cold Mountain. The trail takes in unique geology and climbing challenges along its 30-mile stretch, and ardent hikers spend several days on the route, taking in the sights and enjoying wilderness camping by night. Cold Mountain looms above the horizon south-west of the town of Asheville. 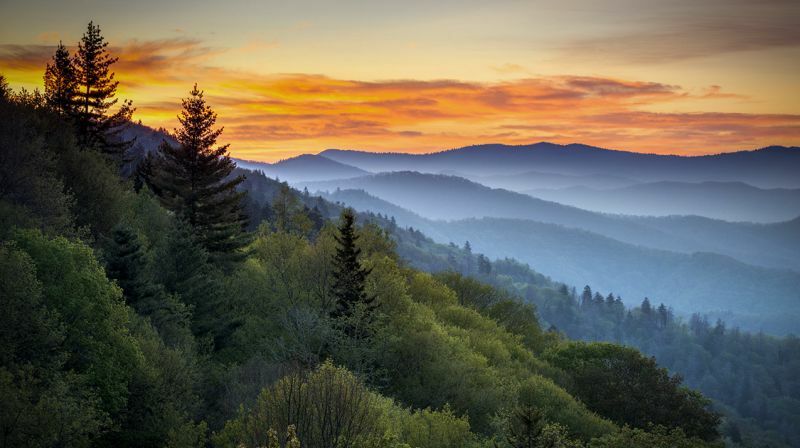 Once known as the ‘Land of Sky’, Asheville was originally a hub for livestock drovers before transforming into the thriving and eclectic town it is today, famed for its Appalachian mountain music performances. Thirty miles along the pathway from Asheville, visitors will find Milepost 412.2, where the first glimpse of the Cold Mountain peak can be seen. For a closer look at Cold Mountain, visitors need to be prepared to make a 10.6-mile hike after leaving the Art Loeb trail at the Daniel Boone Scout Camp. Around two miles into the hike, visitors will find the clear and plummeting Sorrel Creek that runs past several campsites, before the trail ascends to the beautiful Shining Rock Ledge, and a final 1.5-mile climb brings hikers to the summit. This route is not for inexperienced hikers as there are no signposts, and it is easy to get lost without the help of good maps and a compass. Although many people have not visited Cold Mountain, the name is instantly familiar due to the 1997 novel of the same name, written by Charles Frazier. The novel tells the story of a wounded deserter from the Confederate Army around the time of the end of the American Civil War. WP Inman walks for several months to return to his sweetheart, and his journey includes flashbacks of their history together before Inman left to go to war. The novel sold 3 million copies worldwide and became popular again when a film called Cold Mountain was released in 2003. Based on the novel, the film starred Jude Law, Nicole Kidman and Renée Zellweger in the lead roles. Although much of the movie was set in Romania, it does contain scenes that are shot at Cold Mountain itself, although the fictional town of Cold Mountain does not exist. The area around Cold Mountain is filled with historical visitor attractions, making this a wonderful area to stay for a holiday. Twenty minutes from downtown Asheville stands a pioneer homestead that once belonged to North Carolina’s Civil War governor, Zebulon Vance. The two-storey homestead has been reconstructed around the original chimney and contains household items and furnishings from the early 18th century. Within the grounds are log outbuildings that were once used as a slave house, smokehouse and corn crib, and demonstrations of pioneer skills can be seen during special events. The Appalachian settlement of Cataloochee was once a prosperous settlement before its families sold their homes to the government, and the Great Smoky Mountains National Park was established. Several of the structures still stand, giving visitors a glimpse of a simpler way of life. A growing herd of re-introduced elk can be seen in the region, as well as wild boar, bear and turkey. I love those photos you took!